The logo for the second-to-last BracketBusters event. Personally, the weekend of the ESPN BracketBuster games was always one of my favorites of the college basketball season. For once, the sports world stopped caring about who the 8th-best team in the SEC was, and instead focused on some of the best mid-major teams who had the chance to become everyone’s Cinderella team come March. While I understood the reasons for ending the challenge after the 2012-13 season, which included travel concerns, lack of meaningful games, and a few key mid-major conferences electing to not participate, I was still disappointed to see it go. After all, in a time before ESPN3 made it possible to see mid-major games from all across the country, the BracketBuster event gave me the opportunity to check out teams I had heard about, but not watched live. Also, as a fan of a team who played in a BracketBuster game that could have helped get my team onto the at-large bubble, I had seen first hand (just as George Mason in 2006 and VCU in 2011 had) how important these games could be. This year, as I watch mid-majors such as Middle Tennessee State, UNC-Wilmington, Illinois State, and New Mexico State run off win after win yet still likely face the reality that a loss in the conference tournament would end their NCAA Tournament aspirations, I decided to create my own hypothetical “BracketBuster” games, creating 10 matchups I would love to witness. NOTE: I am not including Gonzaga, the A-10, or the Mountain West, as they did not participate in the event. However, I am including the CAA and other leagues that did not participate due to TV deals. This would be, without a doubt, the headliner of the event: a Top-25 team in St. Mary’s looking for another quality win to boost their NCAA Tournament seeding vs an Illinois State squad in desperate need of a second headline win to give themselves a chance at an at-large bid should they stumble at “Arch Madness”. The game would definitely be a low-scoring affair, but that wouldn’t take away from the excitement. These two teams have 2 of the better resumes of the squads in this hypothetical event. Valparaiso has 3 top-100 RPI wins (Rhode Island, Alabama, BYU), while MTSU has 4 (Ole Miss, Vanderbilt, UNCW, Belmont). While those totals still aren’t likely to wow the committee, one more showcase win could go a long way in getting one of these two teams into the at-large discussion. On the other hand, this could wind up being one of the cases in which the BracketBuster game actually hurts a team, as MTSU’s at-large hopes might be better without playing the game than they would be if they lost. This game would pit two teams with incredible win-loss records who lack quality wins. Neither team currently has a win over a team with a top-75 RPI, however both teams have remained on the fringes of at-large consideration due to their lack of bad losses (or losses in general, for that matter). Perhaps a win would springboard one of these teams into more serious at-large consideration, but if nothing else could boost seeding chances come Selection Sunday. This would be a must-win game for both teams if they want to remain on the at-large bubble. Wichita State has played a tough schedule, but doesn’t have a single top-100 RPI win and likely will only get one more chance (Illinois State). On the other hand, UT-Arlington, once a trendy at-large pick, has lost quite a bit of traction lately thanks to the demise of Texas and a pair of conference losses to 150+ RPI teams. The bench mob is back and headed to northeast Ohio to take on an Akron team that hasn’t lost on its home floor since February of 2015. Neither team has much of a shot at an at-large bid due to a lack of quality wins, but winning this one might be the difference between a 13 seed and a 12 seed in the NCAA Tournament, should the winner win their conference tournament. The impact of moving up from 13 to 12 increases the winning percentage of the lower seed by over 15% since the tournament expanded to 64 teams, so this game would have huge implications. While Nevada put together one of the greatest comebacks in college basketball history in the season’s first matchup with New Mexico, that game still brought question to Nevada’s tag as the Mountain West’s best team. Those questions were answered in a big way tonight, as the Wolf Pack rolled past the Lobos 82-65 behind a season-high 26 points, including a few thunderous dunks, from sophomore big man Cam Oliver. The win cements Nevada’s status atop the Mountain West, as the Wolf Pack now sits alone at 7-2 in first place in the conference. It was a slow start offensively for the Wolf Pack, but the Lobos were unable to pull away thanks to a fast start by the Pack’s Jordan Caroline. Caroline, the redshirt sophomore transfer from Southern Illinois who torched New Mexico for 45 points earlier this month, scored 11 of the Pack’s first 12 points to keep Nevada within 2 eight minutes in. Then, Nevada heated up, using an 11-0 run to take an 8 point lead and sending a huge Lawlor Events Center crowd into a frenzy. New Mexico recovered nicely, quickly cutting the Wolf Pack lead to one, but a sequence late in the half proved critical in shifting the momentum back to Nevada. After the final media timeout of the first half, the Wolf Pack locked in defensively, conceding just 3 points the rest of the half. Meanwhile, a big dunk by Oliver, a 3 by D.J. Fenner, and a free throw by Caroline extended the Nevada lead back to 6, 37-31 at halftime. In the second half, Nevada had the answer to every New Mexico run. Early in the half, it was a 3 by Oliver that the Wolf Pack some breathing room after the Lobos had cut their deficit to one. Later on, an 11-2 run brought the Nevada lead back to double figures after their lead has been shaved down to four. However, the late sequence as the game headed down the stretch sealed the deal for the Pack. Nevada hit triples on 3 straight offensive possessions, two by Marcus Marshall and one by Oliver, to give Nevada their largest lead of the night of 15 with 4:15 to go. That hot stretch was part of a 3-point barrage that saw the Wolf Pack drain 13 threes in the game. From there, the outcome was never in doubt. Caroline posted 20 points and 8 rebounds for the Wolf Pack, while Marshall added 13 points. Nevada was able to capitalize on 17 New Mexico turnovers for 20 points. Tim Williams and Elijah Brown each had 18 points for the Lobos, who fall to 6-4 in Mountain West play. Both teams return to action Wednesday, when Nevada travels to take on Utah State and New Mexico heads to Vegas for a matchup with UNLV. After Iona lost 3 of 4 MAAC games in early January, many wrote off the Gaels as MAAC title contenders. Those people appear to have spoken too soon. Iona led from wire-to-wire in a tough road atmosphere, beating Siena 77-66 for their 4th straight win. Rickey McGill had a career-high 22 points for the Gaels. From the outset, Iona was able to silence the 6,826 crowd, using an early burst from McGill to take a 15-8 lead 8 minutes into the game. McGill scored 11 of the first 15 points for the Gaels. Siena answered with a quick run to cut the deficit to three but Iona had the answer, a common theme of the night. Every time the Saints tried to get the crowd back into the game, the Gaels answered with a three or a short run to retake control of the game. After a 3-point play by Javion Ogunyemi, who had 16 points in the game, cut the Iona lead to two, Iona went on a huge run spanning between the two halves to quickly turn an intriguing game into a blowout. In the end, it was a 22-8 run for the Gaels, giving them a 52-36 lead 4 minutes into the second half. Siena never cut the deficit to single digits after that point. A few times, Siena seemed ready to make their push, but like clockwork, the Gaels would respond. After a Marquis Wright three at the end of the shot clock cut Siena’s deficit to 53-43, Sam Cassell Jr. drained a three right away, silencing a Siena crowd that seemed ready to get back into the game. The Saints really struggled shooting the basketball tonight, shooting 3-19 from downtown and 11-21 from the foul line. “We were lucky tonight that they weren’t on their outside shooting game.” Iona Head Coach Tim Cluess said. The result was never really in doubt down the stretch, with both teams emptying their benches in the final minutes. Tonight was arguably the Gaels’ best performance of the season, as they had no issues despite struggling on the road this season. More impressive is the fact that they did it without a good performance from star big man Jordan Washington, who was a non-factor due to foul trouble. McGill’s 22 points led all scorers, while Much added 20 off the bench and EJ Crawford added 13 points. The Gaels are 14-8, 7-4 in conference play. Marquis Wright led the way for the Saints with 16 points, 6 rebounds, and 7 assists. Brett Bisping added a double-double with 10 points and 14 rebounds. Siena falls to 9-13 on the season, 6-5 in the MAAC. All quotes in this story are per A Daly Dose of Hoops/Twitter. It’s hard to believe, but we are just a few days away from February, the final month of the regular season. Most conferences are approaching halfway through their regular season slates, and teams are gearing up for the stretch run to look for good seeding in their conference tournaments. Here’s a look at some teams moving in the right direction, and a few who are in desperate need to turn things around. The Redbirds have now won 10 straight since a loss to San Francisco at the Diamond Head Classic, including a huge win over Wichita State earlier this month. They boast an oustanding defense that hasn’t allowed 70 points in regulation in 12 games, holding 8 of those teams under 60 points. Now 17-4, Illinois State has worked its way onto the NCAA Tournament bubble, and with the bubble being incredibly weak this season, its certainly not inconceivable that the Redbirds could find a way into the Big Dance even if they falter at “Arch Madness” in just over a month. Three weeks ago today, Oakland went on the road and beat preseason Horizon League favorites Valparaiso by 12 to move to 13-3 on the year. The Golden Grizzlies looked the part of a mid-major no powerhouse would want to see in March. Now, they face a must-win game tonight vs Green Bay to stay in contention for the Horizon League title. The defense, which was so good early in the season, has been awful of late, giving up 70 or more points in 4 straight games after doing so just 5 times all season up to that point. Simply put, Oakland needs to turn things around fast, or what was once a promising season will turn into a very disappointing one. 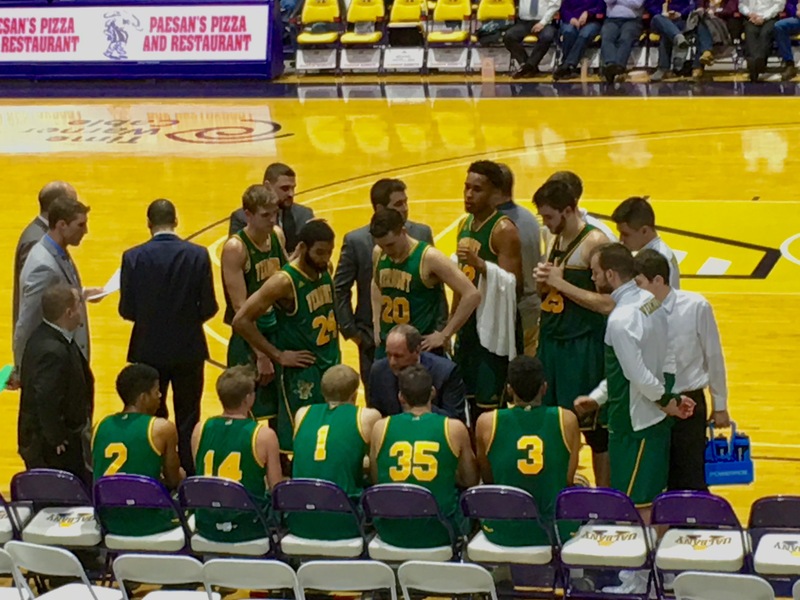 The first two months of Siena’s season were about as bad as they could have imagined. The Saints stumbled to a 4-11 start and lost their first 10 road games, while dealing with multiple suspensions to key players. Now, despite losing super sophomore Nico Clareth, who has taken an indefinite leave of absence from the team, the Saints are finally demonstrating the potential everyone saw to pick them second in the MAAC in the preseason. Siena has won 5 of 6 heading into tonight’s showdown with Iona in downtown Albany, and look primed to become a major challenger to Monmouth in the MAAC title race. Expectations were so high entering the season for the Rams, who at one point were in the AP Top 25. An NCAA Tournament berth seemed likely, if not locked up. Now, things look bleak with 3 losses in 5 games, including an 11 point loss to Richmond on Wednesday. It seems pretty clear what needs to happen for URI to turn things around: Hassan Martin must play well. In the 3 conference wins that Martin has played in, Martin has posted double figures in scoring. In the 3 conference losses, Martin has averaged just 5.7 points. The Rams need Martin to give them consistent production if they want to get back on track. Towson would have seen their name next to “Stock Down” a couple weeks ago, when they had opened CAA play 0-4. Since, however, the Tigers are playing outstanding basketball, winning 5 straight to get into contention for a top 3 seed in the CAA Tournament. This is a very deep team, with 10 players averaging 10 minutes per game, that I believe could really do some damage going forward in the CAA. Their size and physicality could pose problems for UNCW, a team that lacks depth in their frontcourt. Every time this BYU team seems to have turned a corner, they have an inexplicable loss. Recent losses to San Diego and Santa Clara have shown me that this team is too inconsistent to be true contenders in the WCC. While the Cougars certainly have offensive firepower, it will be difficult to beat St. Mary’s and Gonzaga on back to back days, something that appears necessary in order to win the WCC Tournament. It has been a disappointing season for the Cougars, and it looks like BYU will miss the NCAA Tournament in consecutive seasons for the first time in the Dave Rose Era. The Eagles entered a 3 game stretch beginning last Thursday night against the 3 teams I believed to be their biggest competition for the Big South title: UNC-Asheville, Liberty, and Gardner-Webb. Winthrop passed the test with flying colors, winning all 3 games to take control of the Big South halfway through conference play. The Eagles have one of the most dynamic 1-2 punches in mid-major basketball in point guard Keon Johnson and forward Xavier Cooks, this looks like the year that Winthrop, after losing in the conference championship game in 3 straight seasons, finally seals the deal and reaches the NCAA Tournament. Rice’s inability to win close games during conference play has plagued them, as the Owls fell to 3-5 in C-USA play with last night’s 80-72 loss to Old Dominion. All 5 conference losses have been by 10 points or less, but right now, Rice can’t seem to get over the hump. With 7 games in a row upcoming against teams with a combined winning percentage of .341 this season, the Owls must start racking up wins. If not, this season will go down as a disappointment. Paced by the outstanding guard duo of Tookie Brown and Ike Smith, Georgia Southern is out to a 7-0 start in the Sun Belt and holds a two game lead over second-place UT-Arlington. The Eagles have a very navigable upcoming stretch, with no games against the league’s top 4 teams until a 2/20 matchup with UT-Arlington. By then, Georgia Southern could have the regular season conference title locked up. As of right now, it appears that the Aztecs won’t be a factor in the Mountain West title race, something that hasn’t been the case in a long time. SDSU is just 3-4 in Mountain West play this season, with the latest loss coming at the hands of Air Force Tuesday night. The Aztecs just haven’t put it all together yet in MWC play, and their NCAA Tournament chances are very much in doubt. The good thing for SDSU is the balance (or weakness, depending on how you look at it) of the Mountain West right now. If the Aztecs can string together a long winning streak, they could get right back into the thick of things in the MWC title race. The University of North Dakota is the latest school to change conferences. UND President Mark Kennedy and Athletic Directer Brian Faison announced today that the Fighting Hawks will join the Summit League in all sports except football beginning in July of 2018. This will end North Dakota’s membership of the Big Sky Conference, which it joined in 2012 after leaving the now-disbanded Great West Conference. The news was first reported by The Grand Forks Herald. A move to the Summit League makes sense geographically for the Fighting Hawks, as UND is the only school in the Dakotas that isn’t a current member of the Summit League. North Dakota has played North Dakota State every season in which both schools have been D-1, but the Fighting Hawks haven’t played South Dakota State since the 2014-15 season and have never played South Dakota as a Division 1 member. It seemed likely that an addition or subtraction was likely to the Summit League, as the conference currently has 9 teams. The move will leave the Big Sky with 11 members in basketball. It is unclear whether the conference will look to fill North Dakota’s spot. North Dakota’s basketball team currently sits a half game out of first place in the Big Sky, with a 6-2 conference record. The Fighting Hawks have an excellent chance at reaching their first Division 1 NCAA Tournament in program history this season. Last year, Stony Brook came to SEFCU Arena riding an 18-game winning streak and left with their first loss in 2 months. Tonight, Vermont entered the same venue with a 8-game winning streak, with Albany looking to once again snap a long streak. However, the Catamounts made sure that history did not repeat itself, maintaining control throughout en route to a 60-49 win in what may have been the toughest test standing between them and an undefeated conference season. Trae Bell Haynes led the Catamounts with 18 points. It was an ugly game throughout, with the teams combining to shoot just 36% from the field. In the end, the difference in the game was the Catamounts’ ability to shut down the high-scoring sophomore duo of David Nichols and Joe Cremo, who were held to just 9-33 from the field. Early on, Albany hung around, using some 1-3-1 zone to slow the Catamounts on offense. Things were sloppy for Vermont, as they missed 4 straight free throws at one point and conceded 7 offensive rebound in the first half. Late in the half, Vermont made their push, closing on a 6-0 run to carry a 31-25 advantage into halftime. That run carried over into the second half, as Vermont held the Great Danes scoreless for over 7 minutes across the two halves to take a 35-25 lead. Although they were able to shut down the Danes on offense, they couldn’t pull away, missing a few 3’s that felt like daggers. While Albany had the girth advantage down low, their bigs struggled to get position or finish against the Vermont big men, missing lots of in-close attempts. The Catamounts final dealt the crushing blow with just over 5 minutes to play, when a transition 3 by Ernie Duncan gave UVM a 53-38 lead. The only time from then on where the Danes seemed to a have a glimmer of hope came with just over a minute to play, when Ernie Duncan missed the front end of a one-and-one to keep the Danes within 9. However, Travis Charles’ outlet pass hit an unsuspecting Cremo in the back as he ran up the floor, and the ball rolled out of bounds. That sent the remaining fans to the exits, as the small Catamounts cheering section rose to their feet to applaud their team on a good road win. Kurt Steidl added 10 points for Vermont, while Darren Payen and Dre Wills each contributed 8 off the bench. Joe Cremo had 13 points and a career-high 11 rebounds for the Great Danes. Nichols added 12 points. Vermont concludes a stretch of 3 road games in 4 games with a Saturday trip to Long Island to take on Stony Brook. Albany will look to get back on track Saturday at Hartford. For most of the night, the high-powered St. Bonaventure offense was kept at bay. In the end, however, the Bonnies, especially the guard duo of Matt Mobley and Jaylen Adams, got going, and it was enough to lead a comeback win, 67-63 over St. Joseph’s at the Reilly Center in Olean, NY. Adams scored a game-high 19 points, while Mobley scored all 13 of his points in the final 12:18 to help the Bonnies comeback from an 18 point second half deficit. From the outset, things were a struggle for St. Bonaventure offensively. The Bonnies went over 7:30 without a point in the early stages of the first half, conceding a 13-0 run over that stretch to fall behind 13-2. That opening run set the tone for the entire half, as St. Joe’s held the double-digit lead for the entirety of the first half. While the Hawks have struggled offensively since losing Shavar Newkirk for the season to an ACL tear, they had no such issues in the opening period, posting 42 first half points. A half-court buzzer-beater from Idris Taqqee did give the Bonnies some momentum, but they still trailed by 15 at the break. It seemed like more of the same early in the second half, with the St. Joe’s lead stretching back to 18 on a Lamarr Kimble jumper with 14:07 to play. Kimble led the Hawks with 14 points. It was all Bonnies from then on. A quick 11-2 run got SBU back within striking distance, and it was during that stretch that Mobley got comfortable in the game with a 3 and a pair of assists. However, things still looked bleak for St. Bonaventure when they trailed 61-51 with 4:22 to play. But Mobley heated up, draining triples on back-to-back possessions to bring the Bonnies within 5. After Mobley finished through contact on a strong drive to the rim to cut the deficit to just 1, freshman big man Josh Ayeni drained a mid-range jumper to give the Bonnies their first lead since 2-0. What really keyed the comeback for SBU was the ability to get stops on defense. St. Joe’s slowed down the tempo, which seemed to take away the flow from their offense. This allowed the Bonnies to hold the Hawks to just 2 points in the final 4:22. Adams sealed the deal by going 4-4 from the free throw line in the final 30 seconds. It’s a huge win for St. Bonaventure, who moves to 5-2 in A-10 play to stay 1 of the pace for first in the conference. Meanwhile, it’s yet another setback for the Hawks, who are now 2-5 in conference play.